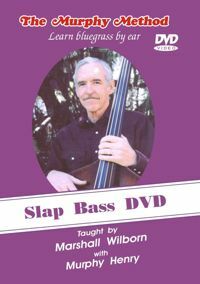 Slap Bass: Ah! You’ve seen someone play “Grandfather’s Clock” on the bass—taking a solo, no less—and you want to do that too! (So much applause and attention from the audience. Nice!) Marshall explains—and demonstrates—the single slap, double slap, and triple slap. He then shows you how to play a whole song using the various slap techniques, explaining all the notes in the song in the process. He makes it look easy! No Tab.